Rediff.com » Sports » Is Pogba 'perfect' for Manchester United? Is Pogba 'perfect' for Manchester United? IMAGE: Paul Pogba in action. Photograph: Christian Hartmann/Reuters. Paul Pogba could spearhead Manchester United's Premier League title challenge if the playmaker can be lured back to Old Trafford, the club's former midfielder Paul Ince has said. Pogba, who left United in 2012 under Alex Ferguson, has been at the centre of a 100 million pound ($129.34 million) bid from the FA Cup winners, according to British media. Spanish giants Real Madrid are one of the favourites to land the French playmaker, the reports added. Pogba was in sparkling form last season as he helped Juventus win a domestic double, and Ince said that the 23-year-old could light up Old Trafford under Jose Mourinho. "I think his style of football will suit the Premier League more than the Spanish league," Ince told Sky Sports. "So Pogba now coming into a league where it is tough, where he can show what he's all about, I think is a perfect fit for him and for Man United." 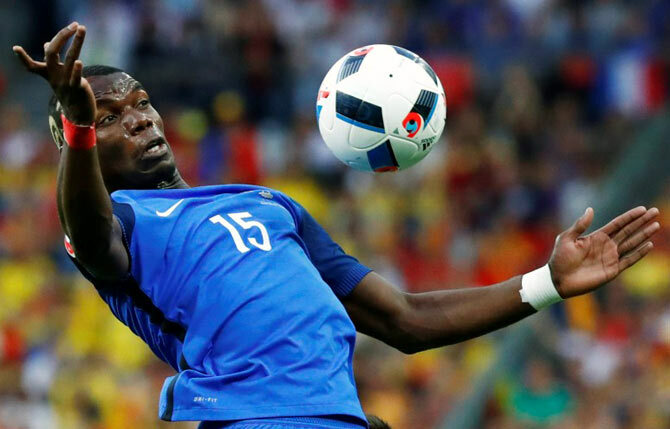 Pogba is currently with the national team having featured in all six games of France's European Championship campaign, where they meet Portugal in the finals on Sunday. Ince added that signing Pogba will showcase United's title ambitions. "Who he plays alongside, whether it's (Michael) Carrick, (Morgan) Schneiderlin or (Bastian) Schweinsteiger -- I don't know. "But if United can get Pogba then that sends out the signal that we are really going for it this year."